Roger Washington, who cut his records in the Big Apple around the turn of the 60s, seems to be an almost unknown artist even to the most ardent of soul fans. This is a real shame as every one of his small number of releases is first class. OK so he wasn’t the best singer in the world but as a blues balladeer he was much more than acceptable, with an appealing light baritone. 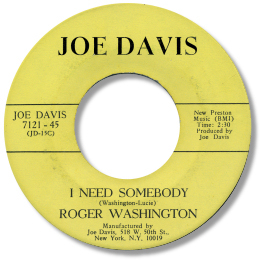 I Need Somebody is a good example of his unfussy approach, and also features some fine bluesy guitar fills as well. His most obtainable 45 is the melodic slowie I Won’t Never Make You Cry, which combines some fine guitar work from the blues tradition with some sanctified piano and organ to excellent effect. This was originally cut for veteran R & B record man Joe Davis and released on his Beacon label before receiving another outing on Burdett. You’re Gonna Want Me is a heavy ballad, with organ and piano straight from the church, and Washington almost chanting the boasting lyric. Amazing “Far Eastern” intro too! 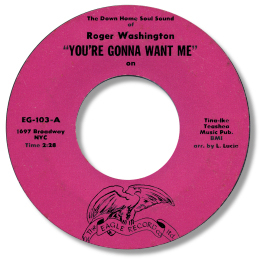 This release is tagged “The Down Home Soul Sound of Roger Washington” – and that sums him up perfectly. "I was playing an old Kent compilation from the early noughties ‘ The Arock & Sylvia’ Soul Story’. There is a sleeve note entry for Billy Washington whose ‘Later for Romance’ cut came out on Arock in 1966. Billy Washington turns out to be Roger Washington, one of the first people that you featured on the Sirshambling site. Ady Croasdell, Peter Gibbon and Mick Patrick who co-wrote the sleeve-notes fail to make the connection to Washington’s earlier cuts but there’s little doubt that its the same singer. Their notes read ..... Billy Washington co-wrote ‘Later for Romance’ with Charles La Harper a prolific songwriter working often in conjunction with the Poindexter brothers for groups such as the Iceman or for Tony Mason, and with Larry Lucie, another New York Stalwart who composed songs for Joe Haywood, amongst other. This is a very good composition and and production typical of the mid-60s with excellent quirky lyrics and a great male backing group. Its the sort of song you can imagine being performed live in a happening club: slick, black and together. Billy also recorded ‘What Did You Do (To My Baby) for the D’Oro label. When he wrote he was sometimes known as Roger Washington and contributed ‘Some Other Place, Some Other Time’ by Albert King released on the recent Kent CD ‘King New Breed R&B’....."
You can see the Billy Washington D'Oro 45 here and listen to his TCF 45 here. Greg finishes by asking if this article here is anything to do this Billy Washington? I can't answer Greg's question - can anybody else? Any way I'm really grateful to Greg for digging out this excellent new info.